YUM!! I spent all last night looking through these recipes and I can't wait to try more! I tried this one last night and it was incredible, my boyfriend and I loved it!! Only problem was finding chicken breast cutlets, so I just cut a thin slice out of a normal size one. My family just got done eating this awesome chicken recipe. They loved it. I will definately make this again soon. Thanks for all the great recipes!!! I made this the other night with turkey cutlets and used pork rinds for the crackers. It was awesome! I made this last night, and they were delicious! My boyfriend has requested them as a weekly meal. Thank you! I love this site. 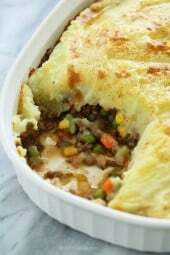 I've tried several recipes and I honestly have loved them all. I made this last night and my boyfriend LOVED IT! He said it was one of the best dishes I've made. I substituted the blue cheese for the laughing cow garlic and herb cheese. I also used the sargento 2% four cheese mix. The final result was moist delicious chicken. I have made quite a few of your recipes and love them all. This one is by far my favorite. I could eat this every day! I made quite a few substitutions because I don't eat mayo or blue cheese. I substitued skim mozzerella for the cheddar (because it was all I had), omitted the laughing cow all together and used 1/2 cup shredded cheese insead, used light ranch dressing instead of mayo. I also used the buffalo wing flavored sauce instead of the red hot. Delicious. Subbed corn flake crumbs and bread crumbs for the crackers and otherwise stuck to the recipe. Chicken was moist and perfectly cooked. I loved it, so good!!! This is a new family favorite. My husband LOVED it! I just cut the portions in half to make it for the two of us. I am so greatful that I came across this site. my family and I have been working on eating right, but we didn't want boring. These recipes are definitely not boring. I will prepare this recipe tonite. My husband loves anything chicken and my son loves anything hot. Please keep the recipes coming.I really do need them. Thanks! This recipe is amazing!! I didn't have celery and just stuck in some spinach. Left off the hot sauce and added tomato sauce. Hubby did the hot sauce. Amazing either way. Is there anything to substitute the hot sauce with? Hubby and I both hate anything that's even a little bit spicy! This was wonderful! The only thing that I changed was I put a packet of ranch mix in with the veggies/cheese since I don't like blue cheese. I can't wait to have the leftovers for lunch. For anyone wondering about making this low carb: I just left off the cracker coating, and it was still great (just a little naked looking). made these last night and they are amazing. I'm craving more for breakfast! Next time I think I'll make the blu cheese to go with. So glad I found you. Gina this was incredible. You are a godsend. Made this tonight — it was absolutely delicious! My husband raved about it! Definitely a keeper. I can envision making this for a football Sunday get together this fall. made this tonight! it was delish! i was worried the sauce would be too spicy as i was measuring out the tablespoons, but the garlic powder really cut down the spice i thought! it really satisfies that craving for spicy food, and the flavor for only 5 points can't be beat! loved it! thanks!! DELICIOUS! I cannot believe the flavors in this for the small amount of points! 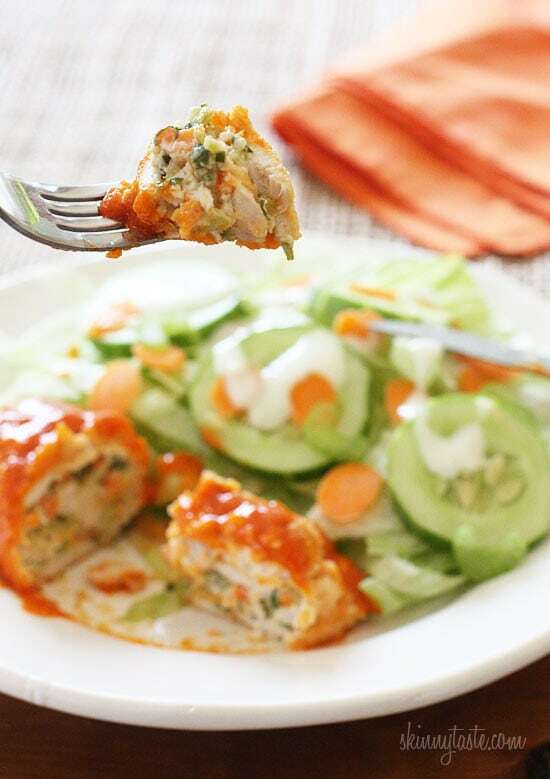 Like having Buffalo Wings without the fat and calories!! I made it on Sunday and it sat overnight. Put it straight in the oven last night and it was such a hit! I didn't have any garlic powder, so I just added a clove when I was melting the butter then took it out. Most definitely a keeper and I will make this again! Thanks for sharing!! This looks amazing! I see some are substituting Panko bread crumbs – what do you think about using 4CC whole wheat bread crumbs? Love all your recipes! This is an awesome recipe! So delish! keep them coming Gina! These were super awesome. NOM. I used the thinly sliced breasts from Trader Joe's and pounded them a bit to make them thinner. Instead of the blue cheese wedges, I used 2 garlic and herb and 2 cream cheese wedges. I am not a good cook but this made me feel like I am! Just finished having these for dinner and they are DELICIOUS!!! Used an egg because I didn't have any lemons. I still added buffalo to the egg wash and it turned out perfectly. 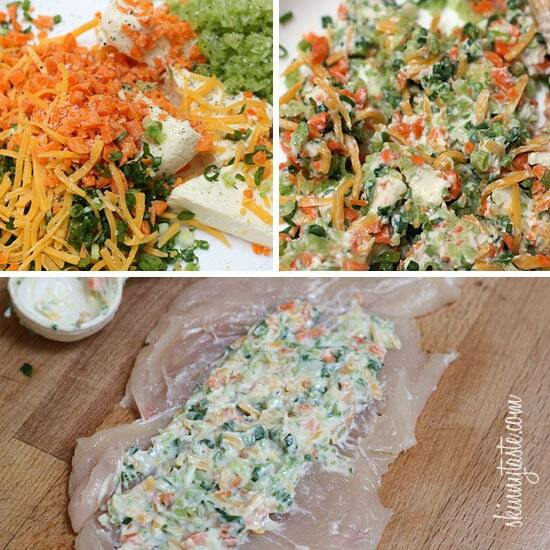 If you are a fan on the Jalapeno Popper Chicken, this is a MUST-MAKE! Thanks for another winner Gina! my husband and I are eating these for dinner as we speak and we both felt compelled that commenting on this recipe was warranted. All my husband can keep saying is omg these are really good. omg these are my new favorite. all I can say is thank you. these are outrageously delicious. This was dinner last night. The supermarket had everything BUT the LC Blue Cheese, so I got the light swiss. It was delicious and I loved the slight heat from the Frank's. Even my 3.5 year old liked it! Anything with hot sauce has been my focus since I was pregnant and continiued after having the baby! I love it! So does the hubby and kiddos. I actually had to make extra! You could always just cut a thick chicken breast in half. Or take the thinly sliced chicken breasts and pound them out more. I made this for dinner tonight and it was amazing! Along with some steamed broccoli it was a tasty and very filling meal. Thank you for all your hard work that makes it fun and easy to eat delicious and healthy food! These are AWESOME had them for dinner tonight YUMMY!!! Quick question! Do you think these could be done on the BBQ? My oven decided to crap out on me today, and i'm dying to try these! Ok i did it! BBQ'd them on double foil, with the two center burners on low and the outside burners on high and they turned out perfectly! I love all your recipes! thanks!! This looks amazing! I saw earlier that you suggest freezing after cooking…do you think they would turn out ok? Any thawing/reheating suggestions? Thank you! These were absolutely delicious! I'm not a fan of blue cheese, so I subbed in low fat herb & garlic cream cheese. My boyfriend definitely approved, and even had seconds, yum. I made this for dinner last night and we loved it! I couldn't find the skinny cow blue cheese wedges so we just used low fat blue cheese crumbles instead. 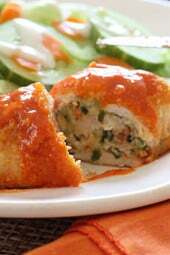 I also had to pound the cutlets so they were easier to roll and so the delicious filling didn't fall out! Thanks for the recipe! As always, you never disappoint! I made this today and it was great. I followed the recipe exactly and it turned out good tasting and good looking (I pounded the cutlets with a kitchen mallet to make them easier to roll). Thanks for the recipe! This looks really good!!!!! More stuffed chicken breast recipes please!!!! So far the zucchini and mozzerella one is my favorite and I'm sure this will be coming in second. Made this last night, it was DELICIOUS!!!! whole family loved it. I just have to practice rolling the chicken so that I can make it look as pretty as this picture, but it was great. This looks amazing! I'll be making this soon! Gina – I just made these and they are AMAZING!!! I've yet to make a pretty stuffed chicken… yours look lovely! Hi Gina! Have a question about freezing. Would I freeze them cooked or raw? I would freeze them cooked, or partially cooked. It filled me up, but you could always use 4 oz of chicken for each if you wish. Hi Gina! I've just found your blog a few weeks ago, and can't stop reading your recipes! (only reading them now as due to a knee surgery I've been away from my kitchen in the last month). Your recipes all look super yummy and super nutritious. And gorgeous food photos as well! I can't wait to make this one, I am salivating already. How spicy is the buffalo sauce? Frank's is milder than others. They also sell a spicier one, but if you are a spice wimp, just drizzle a little on top. I am so going to make this next time I make chicken! OMG! Has to be incredible! I can't wait to try it! Thanks! !BTW, Frank's also makes a Buffalo Wing Hot Sauce. I may use that as well! Thank you again!!! Oh yeah! My husband is going to love this and me too! Surprise dinner for him this week and he does not need to be on WW but I just tell him it's heart healthy. I love all the flavors you combine! Makes we wanna keep eating healthy. Thanks Gina! These sound amazing! I love stuffed chicken breast! I'm wondering what other crackers to use instead of Ritz? They are not a very healthy cracker. I see some are subbing Panko crumbs. You could do a bread crumb panko combo. You are only using 15 crackers for the whole thing (5 servings), so each serving is only 3 crackers. Even though they may not be a very "healthy" cracker, I don't think 3 crackers is that bad, is it? When you weigh out the chicken is the weight for the raw chicken or cooked? I've been having a love affair with buffalo lately. I hope it lastsa while. Gina, I love your recipes. I've lost seven pounds since I started cooking with them in April. I was wondering if the lemon juice could be omitted or if there is a substitute. I have a very bad citrus allergy. Thanks! its too hot to use the oven, could this be done in a crockpot? I made this and my family LOVED it. My father said it was the best chicken he has ever had and he's not even a chicken kind of guy. Another recipe to add to the weekly menu!!!! This is what we are having tonight!! Have everything but the Ritz crackers–thinking Panko crumbs will work! Thanks again for another delicious idea!! When our temperatures finally cool off enough to use a 400F oven these will definitely be made. The only difference I would make is using Mary's Organic Gluten-Free crackers and Panko compared to Ritz. 1 part crackers/2 parts Panko. This makes a great light crust. Do you have a toaster oven? that is how I bake all of my food in the summer, it is just as good. This was was DELISH! My boyfriend loved it too! I need to get better about rolling the chicken though, any tips? Thanks for all your great recipes! I made these last night also, and they were absolutely fabulous! So much better than the boneless buffalo chicken I had at Chilis the other night. And much less fattening! Thanks Gina! 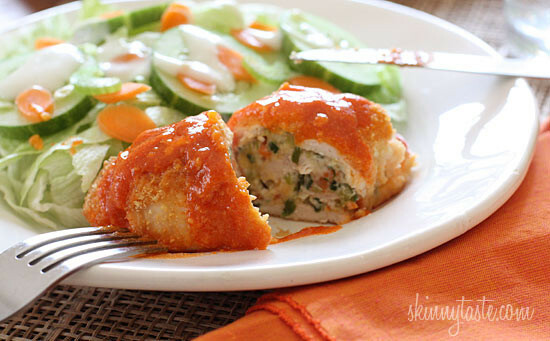 I love all of your rolled chicken breast recipes, but this one by far is my favorite! On another note though, I calculated these into my Weight Watcher's calculator and tracker last night and they came out to be 4 points instead of 5. Just food for thought! Thanks again for the delicious low fat recipe! I think something strange is happening on recipe builder this week! Chicken brats…lol. Chicken breasts…stupid phone. I made these for dinner tonight. It was a major hit. Even my 5 y/o ate two whole chicken brats and he is a very picky eater. I substituted the bleu cheese laughing cow for the garlic and herb laughing cow cheese, only bc that's what I had on hand. Will definitely be cooking this regularly. Thanks so much for sharing! Wow, these look awesome! 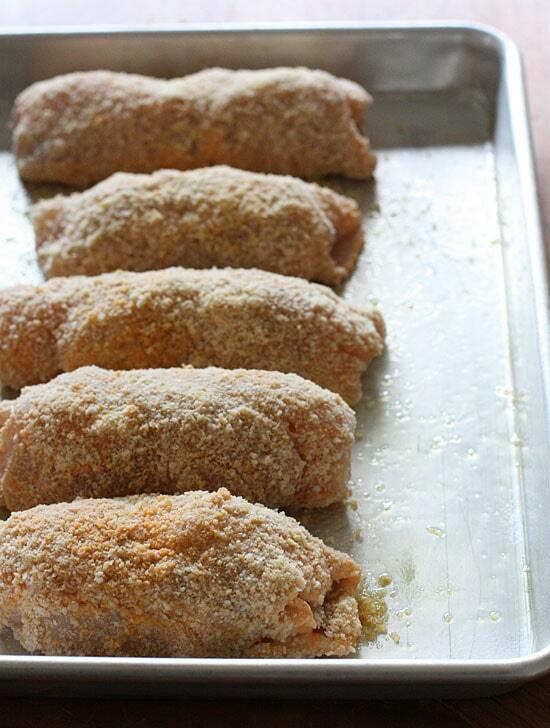 I never thought to make stuffed chicken breasts buffalo-flavored. Could you use the skinny blue cheese dressing in place of the laughing cow bc wedges? I would endure the heartburn for this one! 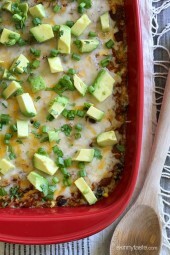 I have this in the oven right now-can't wait for dinner tonight! This looks so delicious! My boyfriend loves every variation of buffalo chicken. Great picture taking skills as well! Yum! Can't wait to try this!!! I will substitute mayo with an egg. These look great! I have friends get together this Friday and I will be bringing these. thanks so much. Looks great but I will probably use low fat cream cheese instead of the blue cheese wedges. Not a fan of BC! I DESPISE blue cheese and decided to make it exactly the way Gina did and it was OUT OF THIS WORLD!!! I will make it again and again- the same way! Words can't express how delicious this looks. YUM! i have everything but the crackers. have you tried it with breadcrumbs? I just made this using italian bread crumbs and it turned out really good. OMG, thank you! This looks amazing!! This looks great! In fact, it's making me hungry. Making this Thursday! You rock Gina! Ingenious!! I can't wait to try this! What could I use instead of the mayo- buttermilk? Egg whites or the whole egg? I can't have hot sauce…what else can you use in place of the hot sauce? You can leave it out, it just won't be spicy. You always post the most amazing things! It is like you are in my head and know what I'm craving! I can't wait to try this! Thank you! Oh my goodness, Gina, how do you do it? It's like your inside my head! 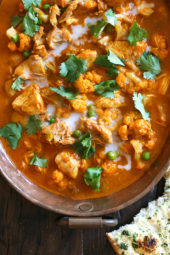 At 14+ weeks pregnant, all I'm craving is spicy food. This is making me droool! Already on the list for next week's menu – can't wait! I was wondering how you get on the list for weekly menus?? Is there anything to substitute instead of mayo? I despise mayo or any type of creamy dressing. I was thing about using some jalepeno nacho cheese instead?? You can replace it with an egg if you wish. I make chicken cutlets dipped in greek yogurt and then bread crumbs. It is delish. My husband hates yogurt, but you can't taste it once the chicken cooks. I plan to use it in place of the mayo when I make this. Healthier too! I also used greek yogurt tonight; it's fantastic! 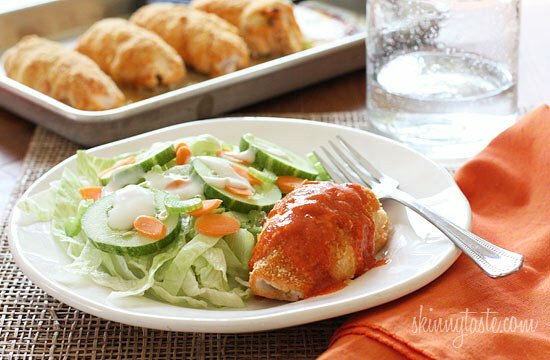 I have been obsessed with all things buffalo chicken lately. This looks delicious!!! Just wanted you to know that as soon as I left my comment, it worked like magic and I could copy and save the recipe! Maybe your site just wanted to know who I was. 😀 Thank you. My son loves buffalo wings and I thought he would love this recipe! Thx for sharing. This looks good but I can't see a print button and it is impossible to copy and save the recipe in order to make it. Am I missing something here so I can print or save it? Thanks. There's also a green "print friendly" button on the bottom of the recipe. this looks so yummy!!! we are not big blue cheese fans – do you think another kind of laughing cow might work?? or maybe use more shredded cheese?? I love the French Onion Laughing Cow, and will use that in place of the Blue Cheese. I'm making this tonight using the Sun-dried Tomato and Basil laughing cow – it's in the oven right now, but I tried the mixture when I first made it before putting it in the breasts and that tasted delicious!